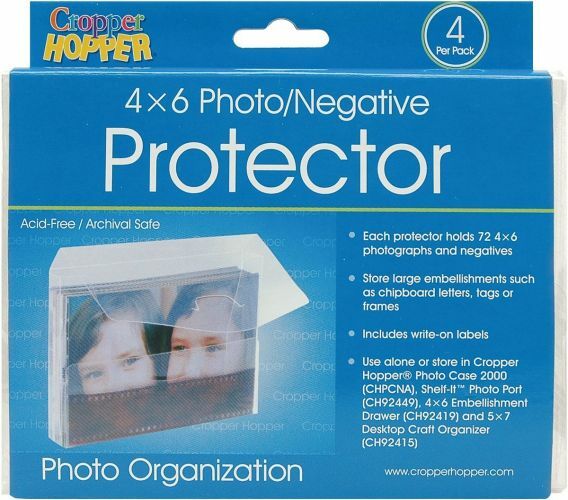 Cropper Hopper Photo Supply Case. These handy cases are made of a collapsible plastic construction that holds up to seventy-two 4 by 6-inch photos/negatives securely for storage or transport; also great for storing and organizing large embellishments; clear stamps; sheets of rub-ons; stickers and much more; each protector features a write-on label; are acid free and archival and can be used in conjunction with Cropper Hopper Photo Case 2000; Shelf-It Photo Port; 4 by 6-inch Embellishment Drawer and the 5 by 7in Desktop Craft Organizer (each sold separately). Imported.